Today is the day my family and I try to create a space for remembering my brother, Aaron Jacobs, outside of the official “Patriot Day” ceremonies and 3-minute bits on cable news and people doing any number of things To Remember for their own reasons. Aaron died in the World Trade Center on September 11, 2001. Ever since I have dreaded the approach of this anniversary. For the first ten years, I did what I could to seal myself off from the world on this day, while also trying to convey something about Aaron to our children as they got older. Then I was moved to start writing about my experience of mourning Aaron in such a world-historical context, starting in May 2011 when bin Laden was killed, and then continuing on the anniversaries since then. I write poetry and got a PhD in English, and so one of the main ways that Aaron and others knew me as I grew up was as a writer. This part of myself had been pushed into the background by mourning, early parenthood, career changes, life in general…so it felt great to reclaim that, and I came to expect that I’d write poetry with Aaron and remembrance in mind at these anniversary times. Having a deadline was really important to me, given my incredible inertia and lack of regular writing practice for most of the past few years, and I was always relieved to produce a poem or two as part of my work of recalling Aaron for myself and the world. But there was also a sort of passing-a-kidney-stone quality to these last-minute acts of creation, which maybe is appropriate given the grinding anxiety I feel for weeks leading up to the anniversary, but which also for me heightened the sad linkage of my puttering-along poetry life with mourning. So I resolved to try and write more regularly and not be that contrived creature, the household Poet Laureate who rips off poems only for birthdays and other state occasions. And as an official 9-11 Family member, I can tell you the post-election nine months have had some of the same quality of marking life Before and After that we associate with remembering September 11th. It’s been satisfying to produce more this year (see below) and have a broader set of topics, driven in part by the urgency of the current national moment. For better or for worse, I am observing this anniversary without a poem for Aaron per se. 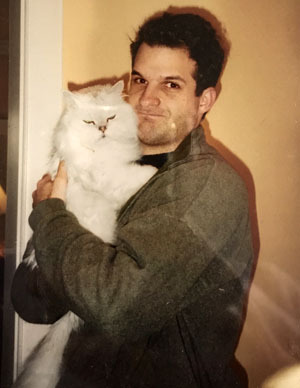 But the timescale of my life as a writer and person does continue to hinge on this day, refracted by the increasing distance from Aaron’s life and by the new ways that surface in which he is so dearly missed. Just one example: in the past few years Amy and I have had a rep as big meanies because we won’t get a dog like every other family we know. There are reasons…we are all allergic, nobody wants to pick up poop, etcetera…but underneath it I just don’t love pets enough to take one on. My parents and I were just talking today about Aaron’s soft spot for all animals, and how we see that shared in one of our daughters especially who squeals over every passing pooch. It is sweet in the moment to try and convey this side of Aaron to the girls, and do justice to his loving nature. But I feel anew the loss of Aaron’s complement and counterweight—the skinny to my chunk, the quick to my pensive—and imagine him as a father who would no question have at least one pet in the house. That would be the model household for our kids, the one we’d be pushed to emulate. I can’t go too far down the road imagining that life and what the last 16 years would have been. If you are reading this and thinking of Aaron and my family, thank you for your support and love. My thoughts are with you, Aaron, your parents, Amy, and the girls. Take care. Josh, love and big hugs to you, your family and parents at this time. Thank you for sharing your thoughts about Aaron and for including this great picture of him.